I have been baking on a weekly basis since Miss E stated kindergarten in September. One of her favorite school snacks are these chewy nut free granola bars. They are so good that they don’t last long in our household. I like them because I know what is in them. Since school started, I find myself constantly reading ingredient labels looking for healthy nut free snacks. Trust me they are not easy to find. These chewy nut free granola bars are healthy, delicious, and make a perfect snack. 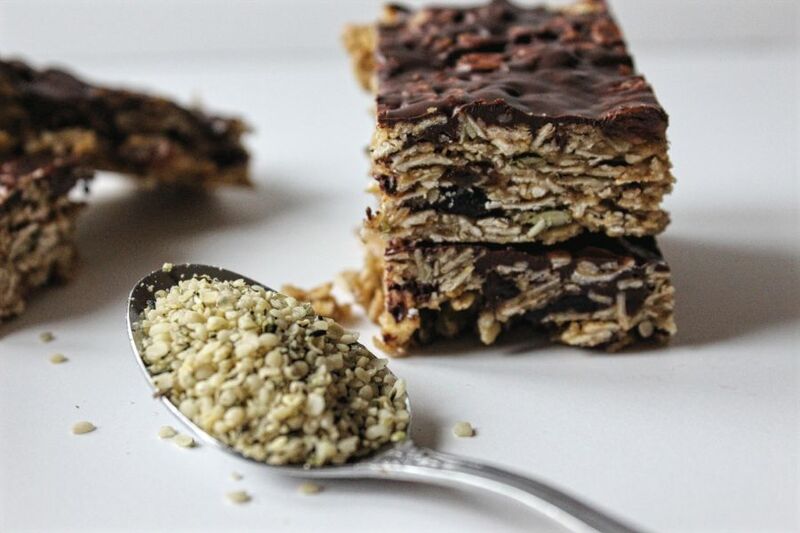 These granola bars are full of healthy ingredients like oats, sesame butter, unsweetened coconut, raisins, cranberries, hemp hearts, and dark chocolate. You can easily substitute any nut butter for the sesame butter if you like. The great thing about granola bars is you can use a variety of ingredients to suit your taste buds. 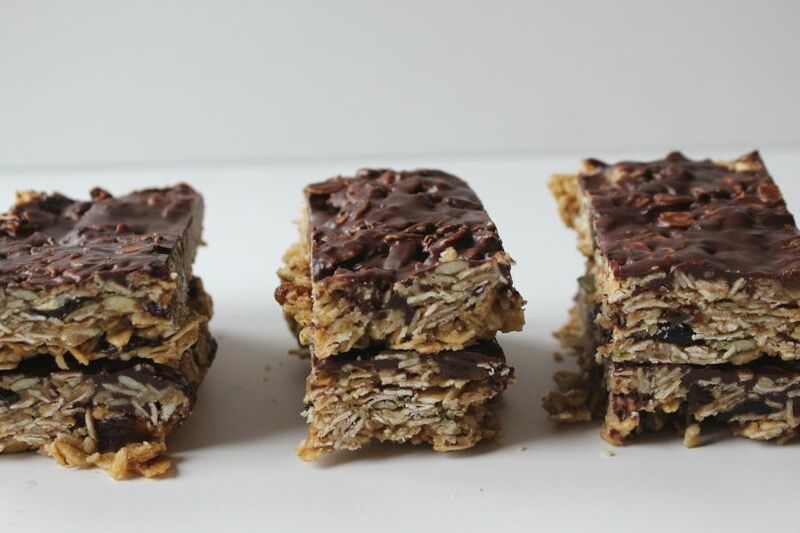 While homemade granola bars are healthier, creating the right texture can be difficult. Most fall apart easily, leaving little crumbs everywhere. To create a chewy texture I used rice syrup and baked them in the oven. Like most girls, (me included) Miss E loves chocolate and could eat it breakfast, lunch and dinner if I let her. I added a thin layer of dark chocolate. Total optional but if you ask Miss E should would probably say its a must. Combine all dry ingredients in a large bowel. Set aside. Add to dry ingredients and mix well. Line parchment paper over the edges of a 9 x9 baking pan. 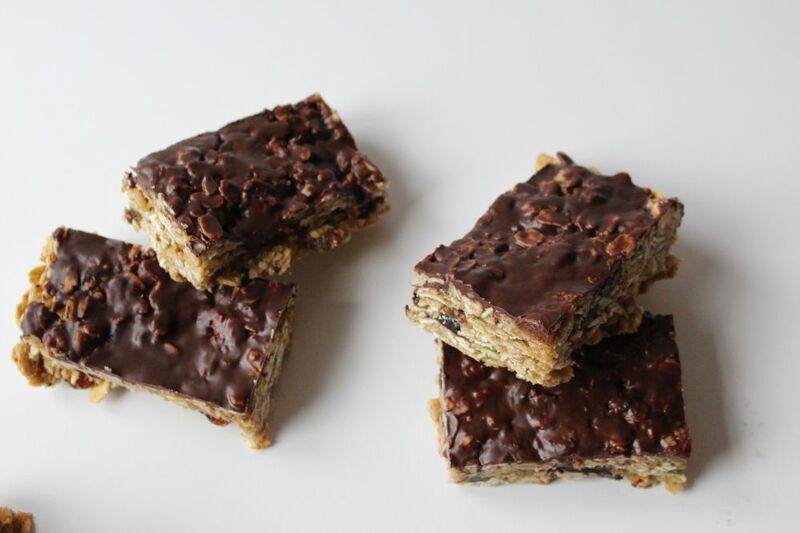 Place dark chocolate over granola bars and place in freezer until chocolate settles. When it comes to making lunches I always include fruit and vegetables. But let’s face it, fresh fruit and vegetables all the time gets a little boring. As a healthier snack I opt for something homemade. Oats are a major staple in our house we eat either homemade granola, oatmeal, or granola bars. Not only are these nut free granola bars perfect for school lunches but are portable healthy snacks to keep us full on those busy days running errands. I hope you enjoy these granola bars as much as our family does.